I love stencils!! I remember the first time I ever tried to stencil, I was living in the Pacific Northwest and I bought a few stencils to liven up my bathroom. Well, true to form back then – I didn’t read a manual or book or anything on how to actually use a stencil…I just tacked the stencil up on the wall, took a stencil brush and put some paint on it – and away I went. Well – the paint seeped through the stencil (because I didn’t “offload” the paint) and, in short, my project came to a schreeching halt! I’ve since learned how to work with these beautiful bits of plastic and there are never ending ways to use them. Melanie Royals – who is my go-to designer whenever I want a stencil – has the most incredible line of stencils in her online store, Royal Design Studio. There you can find very traditional stencils – like damasks and other allover designs…as well as some more modern, transitional patterns that would fit in beautifully in today’s interior designs. She has come out with a new line of stencils that I feel the younger, more contemporary homeowner would love. This is “Chain Link” from her new collection. It looks very modern and “today, ” unlike what many people feel about stencils – old and grandma-like! I just love using geometric patterns in interiors. This is “Linked In” – how’s that for being current? Again, a great overall geometric that many of my younger clients would gravitate toward. It’s subtle – but it has a great energy to it. This is “Hollywood Squares” – and it’s, again, geometric but there’s a definite Hollywood glam and retro feel to this pattern. This is called “Feather Damask,” and it has a modern Swedish kind of feel to it, I think. 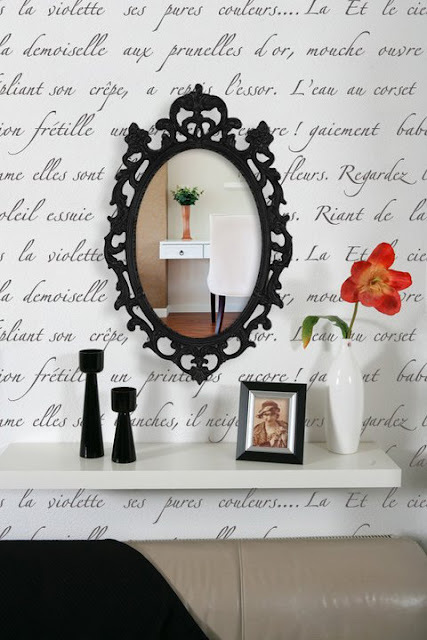 This can be used as an accent wall – perhaps with a neutral gray on the other walls. Add some yellow and gray and cream fabrics and you have a simple but elegantly modern room. 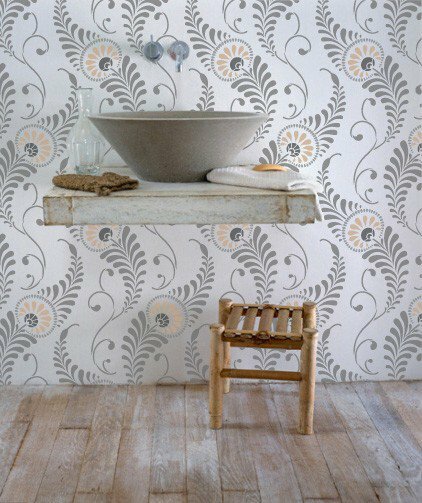 Here, just taking one single motif – in black and white…over a stried glaze and you a have a modern interpretation of a traditional pattern. Another pattern I see a lot of (and I love) is the Suzani pattern. 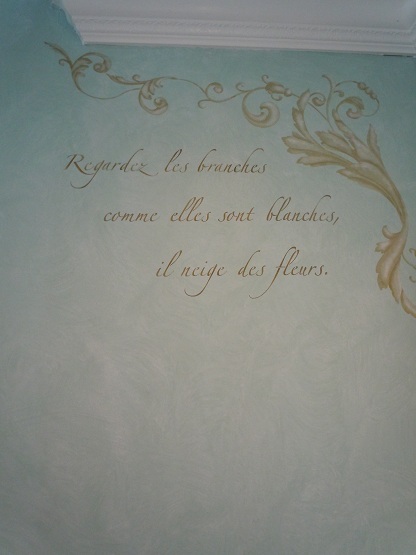 But this time instead of being on a bed or a pillow – it’s on an entire wall. This is refreshingly beautiful. 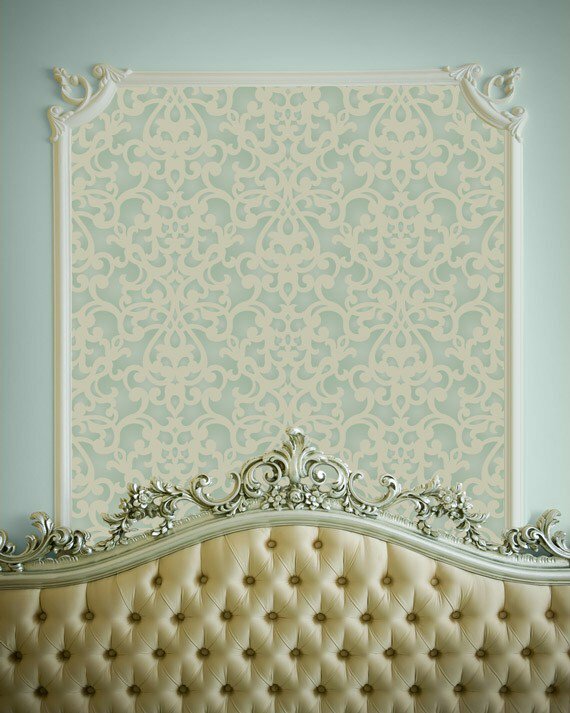 This is the Donatella Damask – a beautiful, more traditional pattern. It looks lovely in a bedroom in soft, hushed colors. Using it as only an accent, as above, is a very inexpensive way to add some pattern and spohistication to a room. 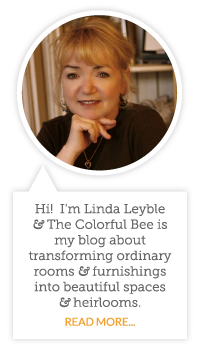 If you would like to give your home a special look and feel, call Linda at 631 793-1315 for a consultation. All photos courtesy of Royal Design Studio, except the last one, which is from me! 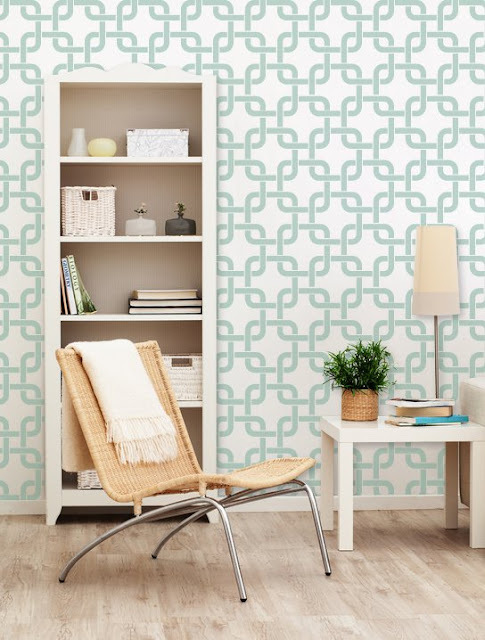 This entry was posted in Uncategorized and tagged transitional design ideas, using geometric patterns, using stencils in interior design. Bookmark the permalink. I love what stenciling ads to plain walls. Any tips for a beginner? Hi – thanks for writing. 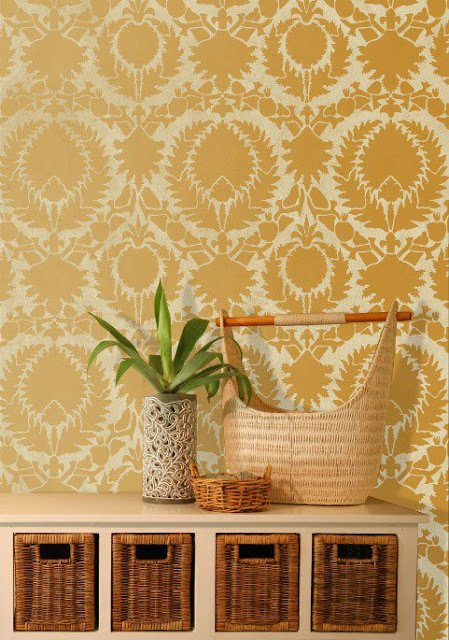 I will do some posts on stenciling – because it's a wonderful (and quick way) to add style and color to your home. A tip for a beginner would be to start with something small – a motif that could be put on a cabinet face…even a pillow (as long as you use fabric paints or add fabric medium to acrylic paint). Practice on a piece of newsprint or paper first. Use good stencil brushes (nothing cheap), dip into your paint (not a lot – just the tip of your brush) and offload the paint onto a paper towel before stenciling – this will help prevent seepage. Make sure your stencil is adhered to the surface (you can use a light stencil adhesive – or just blue painters tape). Go lightly with your brush – you can always go deeper later. I will do some posts on stenciling – so stay tuned! Hi Lynne. Thanks for your comments. There are great patterns out there. 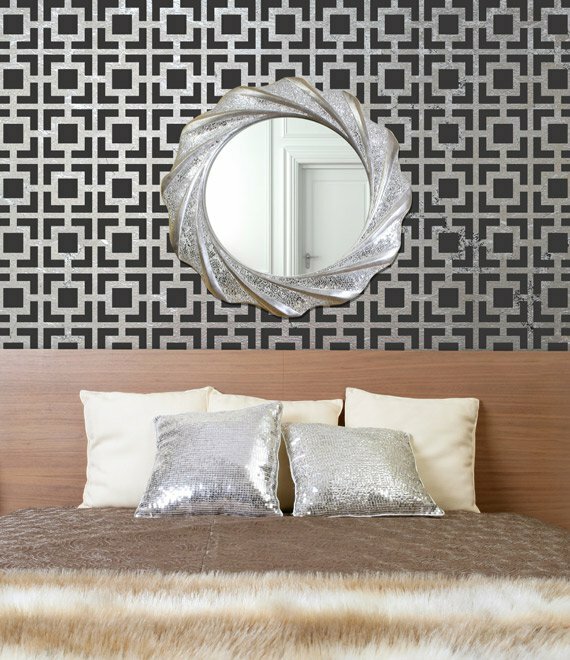 Royal Design Studio is a fabulous resource – also see her Modello Designs – these are one-time-use stencils and you can scale up a small pattern and use it as a ceiling medallion…or a floor medallion. You have to just see this site to believe it. Also – Etsy has some incredible stencil designers who are selling their lines. There's also Cutting Edge stencils – they have some terrific designs – that are more modern. So glad to have met you on Twitter!! Your mosaics are absolutely gorgeous! Wish I had a studio like yours! So glad to hear your Christmas Tour was a success!! Hi Linda! I just came across this post and had to tell you THANK YOU for posting about Royal Design Studio. I so appreciate your comments and business over the years!